← First 2011 ride—shaking out the cobwebs! Wouxun KG-3UVD Handheld--Presentation for Montrose Amateur Radio Club. Click on image to go to presentation, which you can view in its entirety. I recently purchased the very inexpensive ($119.95) new Chinese-made Wouxun (pronounced OH-shing) KG-UV3D radio and am quite delighted with it. However the user interface is drastically different from the Japanese equivalents. I put this presentation together for the Montrose Amateur Radio Club to relate my experience and opinions. The bottom line is that it’s a remarkably inexpensive dual-band 2-meters (144 MHz) / 70 cm (440 MHz) handheld. It’s solidly built and good value for the money. But forget trying to program memory channels using the keypad—spring for the programming cable and use the free software to set things up. Oh, and it also features a wide-band receiver including (of all things) the FM broadcast band. And a flashlight! (Actually, the uses for the flashlight feature are blindingly—forgive the pun—obvious: an extremely handy thing to have.) Do I recommend getting one? Sure! Would this be a good first radio for a newly-minted Technician licensee? Yep! Writing a Mandarin word as “wou” is pronounced like “wo” with a long “o”. So I was about to correct you, but I did some quick research and realized the name (in Chinese characters) of the company would actually be correctly and properly spelled “Ouxun”. I emailed the company, and found out they purposely mis-spelled their name as “Wouxun” because it looks better for marketing purposes. So you are correct, the actual name of the company would be pronounced “O-shun”. (But FYI – in any other situation, any time you see a Chinese word written as “wou” in pinyin romanization, it is pronounced “wo” (with a long “o”)). 🙂 Like I said – silly – but I found that interesting. 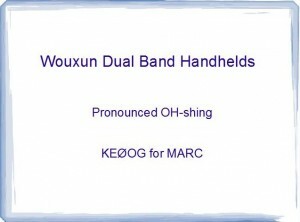 This entry was posted in Computer Tips, Ham Radio blog entries, Product Reviews and tagged chinese handheld, emergency communications, first handheld radio, ham radio, inexpensive dual band, KG-UV3D, Wouxun. Bookmark the permalink. Has anyone been able to configure this radio with the Tinytrac 4 as a tnc? I’m trying to track my weather balloon offline with this radio and the tinytrak, but after 3 days have been unable to get the right configuration to be able to get packets from this radio to the tt4 and decode them to the computer. If anyone has a setup that has worked and would be willing to share, I’d be thankful! ya he adquirido 4 radios wouxun 2 de 2mts y 070cmts y 2 con 220mhz y son exelentes no hay nada que envidiar de las otras marcas conocidas.